1. PURPOSE. This advisory circular (AC) describes the hazards of thunderstorms to aviation and offers guidance to help prevent accidents caused by thunderstorms. 2. CANCELLATION. This AC cancels AC 00-24B, Thunderstorms, dated January 20, 1983. 3. RELATED READING MATERIAL. You can find the current editions of the following ACs on the FAA’s Web site at http://www.faa.gov/regulations_policies/advisory_circulars/. AC 00-6, Aviation Weather for Pilots and Flight Operations Personnel. AC 00-45, Aviation Weather Services. AC 00-50, Low Level Wind Shear. AC 00-63, Use of Cockpit Displays of Digital Weather and Operational Information. 4. GENERAL. Knowledge of thunderstorms and the associated hazards with thunderstorms is critical to the safety of flight. For a thunderstorm to form, the air must have sufficient water vapor, an unstable lapse rate, and an initial upward boost (lifting). A thunderstorm lifecycle progresses through three stages: the cumulus, the mature, and the dissipating. Figure 1, Mature Stage of Thunderstorm, is an example of a mature thunderstorm and the updrafts and downdrafts contained within them. Weather recognizable as a thunderstorm should be considered hazardous, as penetration of any thunderstorm can lead to an aircraft accident and fatalities to those on board. The current edition of AC 00-6 provides more details regarding the atmospheric conditions leading to the formation of thunderstorms. a. Single Cell. A single cell (or common) thunderstorm cell often develops on warm and humid summer days. These cells may be severe and produce hail and microburst winds. b. Thunderstorm Cluster (Multi Cell). Thunderstorms often develop in clusters with numerous cells. These can cover large areas. Individual cells within the cluster may move in one direction while the whole system moves in another. c. Squall Line. A squall line is a narrow band of active thunderstorms. Often it develops on or ahead of a cold front in moist, unstable air, but it may develop in unstable air far removed from any front. The line may be too long to detour easily around and too wide and severe to penetrate. d. Supercell. A supercell is a single long-lived thunderstorm which is responsible for nearly all of the significant tornadoes produced in the United States and for most of the hailstones larger than golf ball-size. a. Anvil. The flat, spreading top of a cumulonimbus cloud, often shaped like an anvil. Thunderstorm anvils may spread hundreds of miles downwind from the thunderstorm itself, and sometimes may spread upwind. b. Bow Echo. Radar echo that is linear but bent outward in a bow shape. c. Convective Outlook. A categorical forecast issued as a narrative and a graphic by the National Weather Service (NWS) Storm Prediction Center (SPC), which specifies the perceived level of threat for convection via the descriptive wording: Slight, Moderate, and High Risk. d. Derecho. A widespread, long-lived, straight-line windstorm that is associated with a fast-moving band of severe thunderstorms. e. Downdraft. A small-scale column of air that rapidly sinks toward the ground, usually accompanied by precipitation as in a shower or thunderstorm. A microburst is the result of a strong downdraft. f. Extratropical Cyclone. Are more commonly referred to as “mid-latitude cyclones.” These are defined as synoptic scale low pressure weather systems that occur in the middle latitudes of the Earth (outside the tropics) having neither tropical nor polar characteristics. Extratropical cyclones are typically associated with fronts and horizontal gradients in temperature and dewpoint otherwise known as “baroclinic zones.” Extratropical cyclones are typical “low pressure” systems that, along with “high pressure” systems, drive the weather over much of the Earth, producing anything from cloudiness and mild showers to heavy gales and thunderstorms. g. Gust Front. The leading edge of gusty surface winds from thunderstorm downdrafts; sometimes associated with a shelf cloud or roll cloud. May also be referred to as a gustnado or outflow boundary. h. Mesoscale Convective System. A complex of multiple thunderstorms that becomes organized on a scale larger than the individual thunderstorms but smaller than extratropical cyclones, and normally persists for several hours or more. i. Mesoscale Information. Analysis of meteorological information pertaining to atmospheric phenomena having horizontal scales ranging from a few to several hundred kilometers (km). k. Roll Cloud. A low, horizontal tube-shaped arcus cloud associated with a thunderstorm gust front. Roll clouds are relatively rare; they are completely detached from the thunderstorm base or other cloud features, thus differentiating them from the more familiar shelf clouds. l. Severe Thunderstorms. Thunderstorms that produce hail one inch in diameter (U.S. quarter-size) or larger, convective winds of 50 knots (kts) (58 miles per hour) or greater, and/or tornadoes. m. Shelf Cloud. A low, horizontal wedge-shaped cloud associated with a thunderstorm gust front. Unlike the roll cloud, the shelf cloud is attached to the base of the parent cloud above it which is usually a thunderstorm. n. Supercool Liquid Water. In the atmosphere, liquid water can survive at temperatures colder than 32 degrees Fareneheit; many vigorous storms contain large amounts of supercooled liquid water at cold temperatures. o. Updraft. A small-scale current of rising air. If the air is sufficiently moist, then the moisture condenses to become a cumulus cloud or an individual tower of a towering cumulus or cumulonimbus. 7. HAZARDS TO AVIATION. All thunderstorms have conditions that are a hazard to aviation. These hazards occur in numerous combinations. While not every thunderstorm contains all hazards, it is not possible to visually determine which hazards a thunderstorm contains. (2) Tornadoes occur with both isolated and squall line thunderstorms. Forecast reports for tornadoes indicate that atmospheric conditions are favorable for violent turbulence. An aircraft entering a tornado vortex is almost certain to suffer loss of control and structural damage. 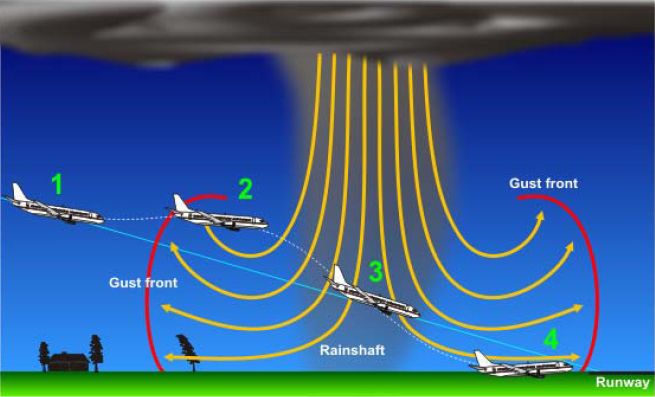 Since the vortex extends well into the cloud, any pilot inadvertently caught on instruments in a thunderstorm could encounter a hidden vortex. (3) Families of tornadoes have been observed as appendages of the main cloud extending several miles outward from the area of lightning and precipitation. Thus, any cloud connected to a severe thunderstorm may contain hidden vortexes. (1) Potentially hazardous turbulence is present in all thunderstorms, and a severe thunderstorm can destroy an aircraft. Strongest turbulence within the cloud occurs between updrafts and downdrafts. Outside the cloud, shear turbulence is encountered several thousand feet above and up to 20 miles laterally from a severe storm. Additionally, clear air turbulence may be encountered 20 or more miles from the anvil cloud edge. (2) It is almost impossible to hold a constant altitude in a thunderstorm, and maneuvering in an attempt to do so greatly increases stress on the aircraft. Stresses are least if the aircraft is held in a constant attitude. (3) A low-level turbulent area is associated with the gust front. Often, a “roll cloud” or “shelf cloud” on the leading edge of the storm marks the top of the extreme turbulence zone. Gust fronts often move far ahead (up to 15 miles) of associated precipitation. The gust front causes a rapid and sometimes drastic change in surface wind ahead of an approaching storm. 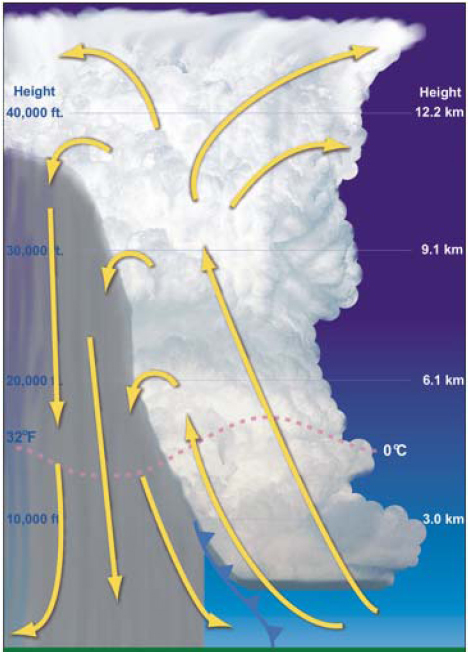 (4) The downward moving column of air in a typical thunderstorm is large. The resultant outflow may produce wind shear, and in some cases the most severe type of wind shear, the microburst. A microburst is a small-scale, intense downdraft that when reaching the surface, spreads outward in all directions from the downdraft center. Virga, streaks of precipitation falling from a thunderstorm cloud but not reaching the ground, may precede a microburst. 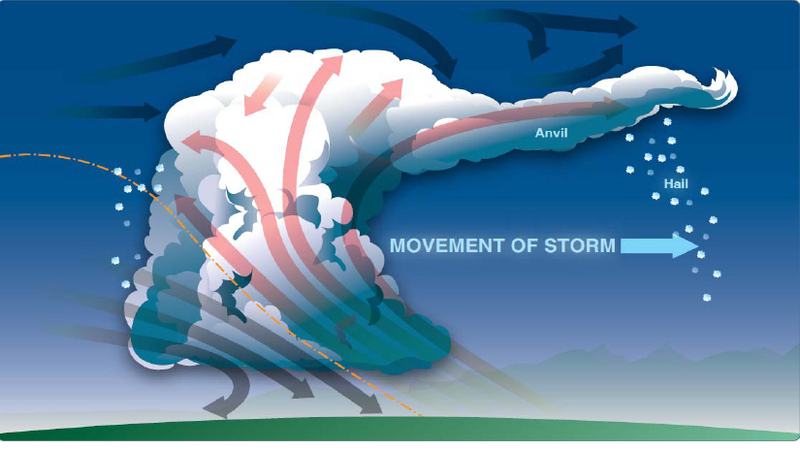 The current edition of AC 00-54, Pilot Windshear Guide, explains in greater detail the hazards associated with gust fronts, wind shear, and microbursts. (1) Updrafts in a thunderstorm support abundant liquid water with relatively large droplet sizes and when carried above the freezing level, the water may become supercooled. As the upward current of air cools to a temperature of about -15ºC, the remaining water vapor sublimates as ice crystals. Above this level, at lower temperatures, the amount of supercooled water decreases. (2) Supercooled water freezes on impact with an aircraft. Clear icing can occur at any altitude above the freezing level but at high levels, icing from smaller droplets may be rime or mixed rime and clear. The abundance of large, supercooled water droplets makes clear icing very rapid between 0ºC and -15ºC, and encounters can be frequent in a cluster of cells. Thunderstorm icing can be extremely hazardous. (1) Hail competes with turbulence as the greatest thunderstorm hazard to aircraft. Supercooled drops above the freezing level begin to freeze. Once a drop has frozen, other drops latch on and freeze to it, so the hailstone grows—sometimes into a huge iceball. Large hail occurs with severe thunderstorms with strong updrafts that have built to great heights. Eventually, the hailstones fall, possibly some distance from the storm core. Hail may be encountered in clear air several miles from the thunderstorm. (2) As hailstones fall through air with temperatures above 0ºC, they begin to melt and precipitation may reach the ground as either hail or rain. Rain at the surface does not mean the absence of hail aloft. Pilots should anticipate possible hail with any thunderstorm, especially beneath the anvil of a large cumulonimbus. Hailstones larger than one-half inch in diameter can significantly damage an aircraft in a few seconds. e. Low Ceiling and Visibility. Generally, visibility is near zero within a thunderstorm cloud. Ceiling and visibility also may be restricted in precipitation and dust between the cloud base and the ground. The restrictions create the same problem as all ceiling and visibility restrictions, but the hazards are increased when associated with the other thunderstorm hazards of turbulence, hail, and lightning that make precision instrument flying virtually impossible. f. Effect on Altimeters. Pressure usually falls rapidly with the approach of a thunderstorm. Pressure then usually rises sharply with the onset of the first gust, and arrival of the cold downdraft and heavy rain, falling back to normal as the thunderstorm passes. This cycle of pressure change may occur in 15 minutes. If the pilot does not receive a corrected altimeter setting, the altimeter may be more than 100 feet in error. g. Lightning. A lightning strike can puncture the skin of an aircraft and can damage communications and electronic navigational equipment. Lightning has been suspected of igniting fuel vapors causing an explosion; however, serious accidents due to lightning strikes are extremely rare. Nearby lightning can blind the pilot, rendering the pilot momentarily unable to navigate either by instrument or by visual reference. Nearby lightning can also induce permanent errors in the magnetic compass. Lightning discharges, even distant ones, can disrupt radio communications on low and medium frequencies. Though lightning intensity and frequency have no simple relationship to other storm parameters, severe storms, as a rule, have a high frequency of lightning. (1) Turbine engines have a limit on the amount of water they can ingest. Updrafts are present in many thunderstorms, particularly those in the developing stages. If the updraft velocity in the thunderstorm approaches or exceeds the velocity of the falling raindrops, very high concentrations of water may occur. It is possible that these concentrations can be in excess of the quantity of water that turbine engines are designed to ingest. Therefore, severe thunderstorms may contain areas of high water concentration which could result in flameout and/or structural failure of one or more engines. (2) At the present time, there is no known operational procedure that can completely eliminate the possibility of engine damage/flameout during massive water ingestion. Although the exact mechanism of these water-induced engine stalls has not been determined, it is felt that thrust changes may have an adverse effect on engine stall margins in the presence of massive water ingestion. (3) Avoidance of severe storm systems is the only measure assured to be effective in preventing exposure to this type of multiple engine damage/flameout. During an unavoidable encounter with severe storms with extreme precipitation, the best known recommendation is to follow the severe turbulence penetration procedure contained in the approved Airplane Flight Manual (AFM) with special emphasis on avoiding thrust changes unless excessive airspeed variations occur. a. Strength of Radar Return. Weather radar detects droplets of precipitation. Strength of the radar return (echo) depends on drop size and concentration. The greater the concentration and/or size of drops, the stronger the echo. Drop size determines echo intensity to a much greater extent than does drop concentration. Hailstones usually are covered with a film of water and, therefore, act as huge water droplets giving the strongest of all echoes. b. Echo Intensity (Reflectivity). The colors on radar images represent different echo intensities (also called reflectivity) measured in decibels of Z (dBZ) (equivalent reflectivity). The dBZ values increase based on the strength of the return signal from targets in the atmosphere. Each image includes a color scale that represents a correlation between intensity value and color on the radar image. Figure 4, WSR-88D Weather Radar Echo Intensity Legend, depicts these correlations for the WSR-88D. The scale ranges from -30 to greater than 75 dBZ. The scale also includes ND correlated to black that indicates “no data” was measured. c. Intensity of Precipitation. Reflectivity is correlated to intensity of precipitation. When the dBZ value reaches 15, light precipitation is present. The higher the reflectivity value, the higher the rainfall rate. Reflectivity is also correlated with intensity terminology (phraseology) for air traffic control (ATC) purposes. Table 1, WSR-88D Weather Radar Precipitation Intensity Terminology, defines this correlation. d. WSR-88D Modes. There are two main operating states of the WSR-88D: Clear Air Mode and Precipitation Mode. Within these two operating states there is volume coverage pattern (VCP) that NWS forecasters utilize to help analyze the atmosphere around the radar. These different VCPs have varying numbers of elevation tilts and rotation speeds of the radar itself. Each VCP therefore can provide a different perspective of the atmosphere. The VCP can be found on the WSR-88D Weather Radar Echo Intensity Legend (Figure 4), above the dBZ value scale. • VCP 31 uses a long pulse that increases the radar sensitivity but decreases the range of the winds velocity that radar can determine. • VCP 32 is the more common Clear Air Mode setting. VCP 32 uses a higher pulse rate that decreases the sensitivity but detects a wider range of winds velocity. • VCP 11 is a common operating mode during severe weather. This mode provides rapid updates as well as the ability to see high into the atmosphere. • VCP 21 is used primarily for “strato-form” precipitation where vertical features of rain clouds are not as important as during the convective, thunderstorm-type of rain. • VCP 12 provides a denser vertical sampling at lower elevation angles. This provides better vertical definition of storms, improved detection capability of radars impacted by terrain blockage, better rainfall and snowfall estimates, and it results in more storms being identified. • VCP 121, 212, and 221 are enhanced versions of the VCP 12 and VCP 21 modes. These modes combine varying pulse rates and different antenna dish rotation speeds to help accurately determine the range of a radar return. e. Radar Reflectivity. The NWS presents radar coverage in two basic reflectivity images. (1) Base Reflectivity. Taken from the lowest (½°) elevation scan, base reflectivity is excellent for surveying the region around the radar to look for precipitation. Base reflectivity image is the first image available during a volume scan. (2) Composite Reflectivity. Utilizes all elevation scans during each volume scan to create the image. It is composed of the greatest echo intensity (reflectivity) from any elevation angle seen from the radar. It is used to reveal the highest reflectivity in all echoes. Composite reflectivity image is one of the last radar image views, necessitated by the need for all elevation scans to be completed before this image can be produced. f. Ground Radar Information—Flight Planning. Thunderstorms build and dissipate rapidly. Therefore, do not attempt to plan a course between echoes. The best use of ground radar information is to isolate general areas and coverage of echoes in order to avoid the whole thunderstorm area. g. Data Link of Ground Radar Information to the Cockpit. Unlike airborne weather avoidance radar, weather data linked from a ground weather surveillance radar system is not real-time information. The radar data displays recent rather than current weather conditions. As the current location of a thunderstorm cell may be different than the broadcast weather product, do not attempt to find a hole in a thunderstorm solely using data-linked weather. Pilots must avoid individual storms by visual sighting or by airborne weather radar. a. Airborne Weather Avoidance Radar. Airborne weather avoidance radar is, as its name implies, for avoiding severe weather—not for penetrating it. Whether to fly into an area of radar echoes depends on echo intensity, spacing between the echoes, and the capabilities of the pilot and the aircraft. The ability of airborne weather radar to detect weather phenomena is limited in both direction and range. Additionally, weather radar detects only precipitation drops; it does not detect turbulence. Therefore, the radar display provides no assurance of avoiding turbulence. The radar display also does not provide assurance of avoiding instrument weather conditions from clouds and fog. A phenomenon, called attenuation, may exist when a cell absorbs or reflects all of the radio signals sent by the radar system. Attenuation may prevent the radar from detecting additional cells that might lie behind the first cell. This is often referred to as a radar “shadow.” For aircraft equipped with airborne weather radar, pilots should be familiar with the operating techniques and limitations of the specific system. b. Airborne Weather Radar Echo Avoidance. Remember that while hail always gives a radar echo, it may fall several miles from the nearest visible cloud, and hazardous turbulence may extend to as much as 20 miles from the echo edge. c. Intense or Extreme Echo Avoidance. Avoid heavy or extreme level echoes by at least 20 miles (i.e., such echoes should be separated by at least 40 miles before flying between them). Pilots may reduce the distance for avoiding weaker echoes. 10. DOS AND DON’TS OF THUNDERSTORM AVOIDANCE. (1) Don’t land or takeoff in the face of an approaching thunderstorm. A sudden gust front of low-level turbulence could cause loss of control. (2) Don’t attempt to fly under a thunderstorm even if you can see through to the other side. Turbulence and wind shear under the storm could be hazardous. (3) Don’t attempt to fly under the anvil of a thunderstorm. There is a potential for severe and extreme clear air turbulence. (4) Don’t fly without airborne radar into a cloud mass containing scattered embedded thunderstorms. Scattered thunderstorms not embedded usually can be visually circumnavigated. (5) Don’t trust the visual appearance to be a reliable indicator of the turbulence inside a thunderstorm. (6) Don’t assume that ATC will offer radar navigation guidance or deviations around thunderstorms. (7) Don’t use data-linked weather next generation weather radar (NEXRAD) mosaic imagery as the sole means for negotiating a path through a thunderstorm area (tactical maneuvering). (8) Do remember that the data-linked NEXRAD mosaic imagery shows where the weather was, not where the weather is. 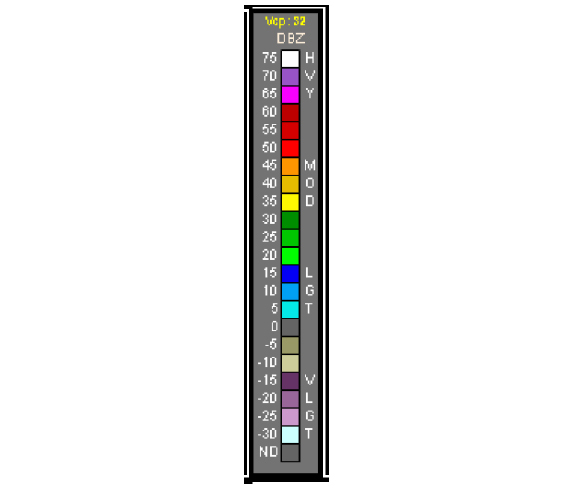 The weather conditions may be 15 to 20 minutes older than the age indicated on the display. (9) Do listen to chatter on the ATC frequency for Pilot Weather Reports (PIREP) and other aircraft requesting to deviate or divert. (10) Do ask ATC for radar navigation guidance or to approve deviations around thunderstorms, if needed. (11) Do use data-linked weather NEXRAD mosaic imagery (e.g., Flight Information Service-Broadcast (FIS-B)) for route selection to avoid thunderstorms entirely (strategic maneuvering). (12) Do advise ATC, when switched to another controller, that you are deviating for thunderstorms before accepting to rejoin the original route. (13) Do ensure that after an authorized weather deviation, before accepting to rejoin the original route, that the route of flight is clear of thunderstorms. (14) Do avoid by at least 20 miles any thunderstorm identified as severe or giving an intense radar echo. This is especially true under the anvil of a large cumulonimbus. (15) Do circumnavigate the entire area if the area has 6/10 thunderstorm coverage. (16) Do remember that vivid and frequent lightning indicates the probability of a severe thunderstorm. (17) Do regard as extremely hazardous any thunderstorm with tops 35,000 feet or higher whether the top is visually sighted or determined by radar. (18) Do give a PIREP for the flight conditions. (19) Do divert and wait out the thunderstorms on the ground if unable to navigate around an area of thunderstorms. (1) Tighten the safety belt, put on the shoulder harness (if installed), and secure all loose objects. (2) Plan and hold the course to take the aircraft through the storm in a minimum time. (3) To avoid the most critical icing, establish a penetration altitude below the freezing level or above the level of -15ºC. (4) Verify that pitot heat is on and turn on carburetor heat or jet engine anti-ice. Icing can be rapid at any altitude and cause almost instantaneous power failure and/or loss of airspeed indication. (5) Establish power settings for turbulence penetration airspeed recommended in the aircraft manual. (6) Turn up cockpit lights to highest intensity to lessen temporary blindness from lightning. (7) If using automatic pilot, disengage Altitude Hold Mode and Speed Hold Mode. The automatic altitude and speed controls will increase maneuvers of the aircraft thus increasing structural stress. (8) If using airborne radar, tilt the antenna up and down occasionally. This will permit the detection of other thunderstorm activity at altitudes other than the one being flown. (1) Do keep your eyes on the flight instruments. Looking outside the cockpit can increase danger of temporary blindness from lightning. (2) Don’t change power settings; maintain settings for the recommended turbulence penetration airspeed. (3) Do maintain constant attitude. Allow the altitude and airspeed to fluctuate. (4) Don’t turn back once in the thunderstorm. A straight course through the storm most likely will get the aircraft out of the hazards most quickly. In addition, turning maneuvers increase stress on the aircraft.